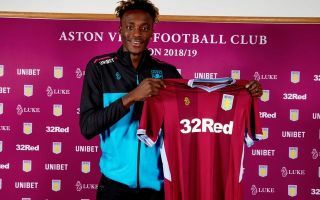 Aston Villa are chasing promotion back to the Premier League, and they’ll hope new loan signing Tammy Abraham will help them secure it after announcing his loan move from Chelsea. As seen in the club’s Twitter post below, they unveiled the 20-year-old on Friday evening ahead of the deadline, confirming that he will spend the rest of the season at Villa Park. With his opportunities to feature at Stamford Bridge scarce, another loan move is arguably the best decision for Abraham, having spent previous stints with Bristol City and Swansea City over the last two seasons. His temporary stop with the former was arguably what convinced Villa to make their move though, as he bagged 26 goals in 48 games to prove that he can deliver in the Championship. It’s still arguably a gamble though given his age and inexperience to bank on him to score the goals to fire them up the table, and so time will tell if Villa emerge as the winners from the deal. However, they’ve taken the punt and could see a great return on their investment in the loanee, just like you could with a spin on online slots for a chance to win big. Nevertheless, Bruce will surely welcome his addition to his squad as he searched for additional firepower to help ensure Villa have the goals in the team to launch a genuine assault for promotion. The season has started well for the club barring their League Cup exit to Burton Albion, as they remain unbeaten in the Championship after five games having won two and drawn three. Signing players like Yannick Bolasie, Anwar El Ghazi and Abraham in this transfer window will surely help them achieve their objective this season, adding to the likes of Jonathan Kodjia and Jack Grealish who have been instrumental thus far. However, time will tell if Abraham can get back amongst the goals on a regular basis again, and if it’s enough to perhaps prove his worth to Maurizio Sarri for next season as he may well hope that he still has a long-term future at Chelsea despite his ongoing loan exits each season.